JUNEAU, Alaska—February employment was up an estimated 0.1 percent, or 400 jobs, from February 2018. Although the growth is very small, it’s noteworthy because February was the second consecutive month of job growth after more than three years of losses. Construction added the largest number of jobs over the year (1,000), followed by oil and gas (500). Manufacturing jobs – which in Alaska are mostly seafood processing – had the biggest over-the-year decline at 500. Retail jobs fell by 300. Overall, the state’s industry sectors were a mix of mostly small gains and losses. The private sector was up 800 jobs and government was down 400. Alaska’s seasonally adjusted February unemployment rate remained at 6.5 percent, and the comparable national rate fell from 4.0 to 3.8 percent. 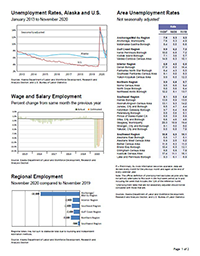 Not‐seasonally adjusted rates fell in most areas of the state, but rose in seven areas and remained the same in the Fairbanks North Star Borough. The state’s lowest rates were in Aleutians East Borough (2.0 percent) and Aleutians West Census Area (2.6 percent) due to winter fishing. Skagway, Kusilvak, Hoonah-Angoon, and Denali had unemployment rates over 20 percent. With the exception of Kusilvak, those areas have significantly lower unemployment rates in the summer when their highly seasonal economies are at their peak activity levels. The Kusilvak Census Area is one of several rural parts of the state with high unemployment rates year-round.